This story was updated on Dec. 19 at 7:20 a.m. EST. An American astronaut, a Russian cosmonaut, and the man who will become Canada's first space station commander lifted off today (Dec. 19) toward the International Space Station. NASA astronaut Tom Marshburn, Russian Federal Space Agency cosmonaut Roman Romanenko, and Canadian Space Agency astronaut Chris Hadfield launched aboard a Russian Soyuz spacecraft from Kazakhstan's Baikonur Cosmodrome at 7:12 a.m. EST (6:12 p.m. Baikonur time, or 1212 GMT). "Everything is nominal onboard; we're feeling well," Romanenko, commanding the Soyuz, said through a translator just after launch. "We are feeling great." "To deal with pre-flight jitters I focus on what matters, right now, & 1 min from now," he wrote Dec. 18 in response to a follower's question. "The entire event is too big & overwhelming." Marshburn, Romanenko and Hadfield will join current space station commander Kevin Ford of NASA, and Expedition 34 flight engineers Oleg Novitskiy and Evgeny Tarelkin, both cosmonauts. From now, it will take two days for the Soyuz TMA-07M spacecraft to catch up with the space station in orbit. Docking is expected on Friday (Dec. 21) at 9:12 a.m. EST (1412 GMT). Marshburn, who worked as a NASA flight surgeon before joining the astronaut corps in 2004, has one previous space shuttle flight in 2009 under his belt. 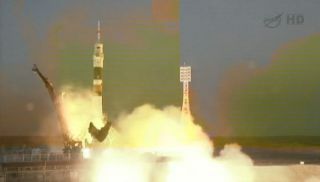 Romanenko is also making his second trip to space following a six-month stay on the space station in 2009.